Whatever the outcome of today's Venezuelan election, the US has neither the right nor the moral standing to intervene. Today, Venezuelans will go to the polls to elect the country’s next president. In the United States, the election has been widely condemned as a sham. While there are good reasons to be highly critical of the election, calling it a sham is a dangerously misleading simplification of a complex and dynamic reality. Most importantly, this stance ignores the very real possibility that the opposition could have won the election, and the fact that this is unlikely to happen not because of government fraud, but due to the hardline opposition’s myopic decision to boycott the election. The sham election narrative is dangerous because it plays into the US government’s and hardline opposition’s longstanding pursuit of (violent) regime change, a ridiculous and illegal strategy that has contributed to Venezuela’s profound woes, as have highly inept government policies. It is also worth pointing out that, as has long been the case, Venezuela is being held to a different standard than other countries in Latin America. While the US government, mainstream pundits, and journalists fall over themselves to condemn Venezuela’s “undemocratic” ways, the same outrage is not shown to countries such as Brazil, Honduras, Mexico, and Colombia. In August 2016, Brazil’s democratically elected president, Dilma Rousseff, was removed from office in what observers call a “parliamentary coup.” And just a month ago former Brazilian president Luiz Inácio Lula da Silva was imprisoned on highly dubious charges. At the time of his arrest, Lula had a significant lead in polls for this year’s presidential election. His imprisonment will almost certainly bar Lula from running. Washington has not only failed to condemn these egregious violations of democratic norms, but has embraced Brazil’s illegitimate president Michel Temer. Other recent examples of the US double standard in Latin America are the recognition of Honduras’s fraudulent November 2017 election and a failure to condemn the recent deaths of dozens of politicians and civic leaders in Mexico and Colombia. Not coincidentally, all four of these countries are generally staunch US allies led by right-wing governments. All this makes it obvious that the US government’s critique of this election is not rooted in a genuine concern with democracy, human rights, or the wellbeing of Venezuelans. US sanctions against Venezuela and pressure on US and European banks preventing them from extending much-needed loans to Venezuela — and thereby directly exacerbating the country’s crisis — also show this quite clearly. Venezuela has committed at least 10 [pre-election irregularities], including banning candidates and parties, manipulating the electoral calendar to benefit the ruling party, allowing electoral authorities to be partisan, failing to properly update and audit voting registries, making welfare subsidies conditional on voting for the government and threatening to check the identity of voters. Evidence supports Corrales’s assertions. In April late year the government banned leading opposition figure Henrique Capriles from participating in politics for fifteen years. The government also prohibited several leading opposition parties, including Capriles’s Justice First party, from this year’s election. In contrast to past presidential elections, which have been held in the second half of the year, this year’s election was called for May — and initially for April — a move seemingly made to allow the government to benefit from higher oil prices and/or the opposition’s disarray following poor results in October 2017 gubernatorial elections. Maduro has also offered benefits to holders of a new national identification card, the Carnet de la Patria, who vote on May 20. These problems are substantial and cannot be brushed away, or considered mere “errors” as Steve Ellner has written. In the July 2017 National Constituent Assembly vote, the National Electoral Council falsely claimed that 8.1 million had voted, when evidence suggests the real figure was around 6.5 million, though this did not change the outcome of the election. And, in a close race in the October 2017 gubernatorial elections, evidence indicates fraud occurred in the state of Bolívar — though this is the only evidence strongly indicating the government committed fraud to change an actual race. Given this, the electoral irregularities that exist in this year’s election are disturbing, indicating the government’s willingness to flout democratic norms in order to stay in power. Most commentators, however, have assumed that Maduro will win. The implicit, and sometimes explicit, reasoning is that the government will simply commit fraud to do so. I agree with the conclusion that Maduro is highly likely to win today’s election, but disagree that fraud will secure his victory. There are two main reasons for this. The first is that the hardline opposition has been urging a boycott of the election for months. This has two major consequences. First, Falcón will receive significantly fewer votes than he would have in an election with full participation by opposition supporters. Secondly, the opposition’s boycott will mean that the opposition will not have the same number of election observers in place as it has in past elections, such as in the 2015 legislative elections, which the opposition won handily. This will, ironically, make fraud more possible, although the depressed turnout means fraud is unlikely to be needed to secure Maduro’s victory. Meanwhile, the opposition has concentrated most of its energy on criticizing the government for its allegedly dictatorial ways, rather than coming up with concrete solutions to the country’s problems. The opposition has thus repeatedly failed to connect with the Venezuelan populace and has not delivered on promised economic recovery. Finally, Chavista supporters, to a significant extent, continue to blame the crisis on an “economic war” waged by the US government and the hardline opposition. While evidence indicates that the government bears substantial responsibility for the crisis, the economic war thesis is not entirely false, as discussed above. Nor, it must be said, is the Trump administration doing anything to counter the notion that the US “empire” is implacably opposed to Venezuela’s government. The US has indicated that it will not recognize the results of today’s election. Amazingly, it has even threatened to sanction Falcón simply for participating in the election. In a similarly hypocritical manner, Canada is refusing to allow Venezuelans living there to vote in the election. All of this means that direct foreign intervention in Venezuela, and ramped-up efforts to stimulate a military coup, grow increasingly likely. The consequences of such actions would, of course, be utterly devastating for Venezuela and the region as a whole. The primary task for journalists, scholars, and activists based in the United States should be to unequivocally reject such imperial adventures. One does not need to defend the Maduro administration to wholeheartedly proclaim that the United States has neither the right nor the moral standing to intervene in Venezuela or otherwise tell the country what to do. Additionally, far from “restoring democracy” a US-led or -supported military coup would very likely result in a brutal right-wing military regime that would unleash its full fury on Chavista activists and pursue policies beneficial to domestic and foreign elites. Is there, then, no hope in Venezuela? A sober analysis must recognize that, at present, there is little reason to be optimistic about Venezuela’s prospects in the near and medium future. Yet, dynamics in Venezuela suggest that more optimistic scenarios are not entirely out of the realm of possibility. Far more than the inept opposition and belligerent US government, the greatest source of hope in Venezuela is the popular sectors, who have shown that their support for the government is not unequivocal or unconditional. For example, in December 2017 there were significant popular sector protests in barrios in Caracas and throughout the country, prompted by the government’s failure to deliver promised pernil (roast pork leg), a traditional Venezuelan Christmas special. Earlier in December, grassroots PSUV (United Socialist Party of Venezuela) activists defied party leadership and voted en masse to make communal leader and Constituent National Assembly delegate Angel Prado the mayor of the municipality of Simon Planas. The party leadership, however, refused to budge, and in January even placed Prado under investigation. 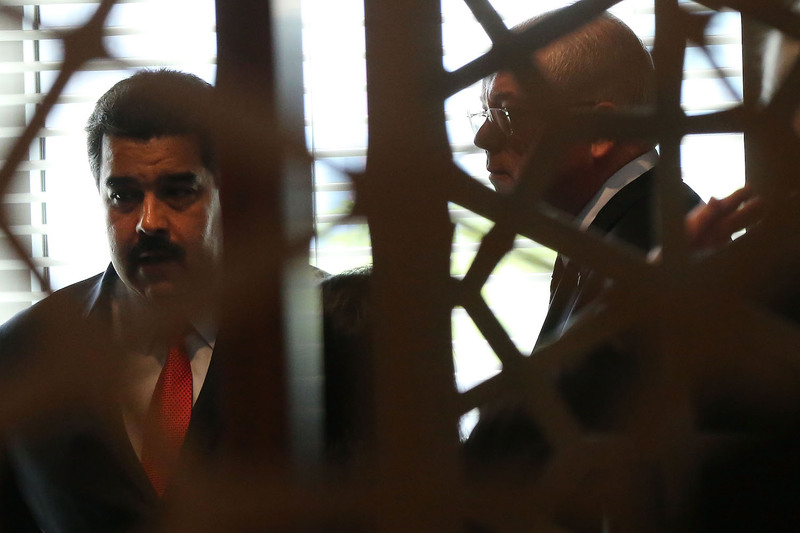 Which Way Out of the Venezuelan Crisis?